Joseph Hunt was born in Bladon, Oxfordshire in 1850, the son of agricultural labourer George Hunt (b1815) and his wife Ann (b1819) a 'Gloveress'. The 1851 census lists George and Ann, together with their three children living at Bladon. The census records indicate that Bladon, like Yeovil, was a centre of the glove-making industry and by the 1871 census 20-year old Joseph was an apprentice glover living at home with his parents in Bladon. In the winter of 1871 Joseph married Eliza Pratley at Woodstock. Joseph and Eliza lived at Bladon at least until their daughter Annie was born in 1875, however by 1879 they had moved to Stoke sub Hamdon - another centre of the glove-making industry - where their son Albert Edward was born. In the following 1881 census the family were living at Ham Hill, Joseph gave his occupation as a glove cutter and Eliza gave hers as a glover. During the mid-1880s Joseph moved his family to Martock and in the 1891 census Joseph and Eliza were listed living at North Street with their children; Annie and Albert and new daughters Rose (b1888) and Lillian (b 1890). Joseph, by now aged 40, gave his occupation as a glove cutter. However by the time of the 1901 census Joseph had changed trade to become a hairdresser with Albert working as his assistant, still living in North Street, Martock. Perhaps there was a downturn in the gloving trade in Martock at this time or perhaps Joseph was attempting to acquire some capital - which he clearly did by the time of the 1911 census. By this time Joseph and Eliza, both aged 60, had been married for 39 years and had eight children although sadly by this time only the two eldest, Annie and Albert, were still living. The surprise is that both Joseph and Albert listed their occupations as glove manufacturers and employers. The family were still living at Martock, although they had moved to East Street. Their glove manufactory was at East Street, Martock at this time but certainly by 1919 Joseph Hunt & Son, 'Glove Manufacturers of Huish', were listed in Kelly's Directory of that year (although their main premises remained at Martock) and the photograph below shows that the premises were still there in 1950. Joseph Hunt died in the autumn of 1955, at Martock, and the glove manufacturing business was taken over by Albert. The company was listed in Kelly's Directory of 1972 as 'Joseph Hunt & Son Ltd, Glove Manufacturers of Mill Lane Trading Estate' but there is no further mention of the company, which had closed down by the 1990s. 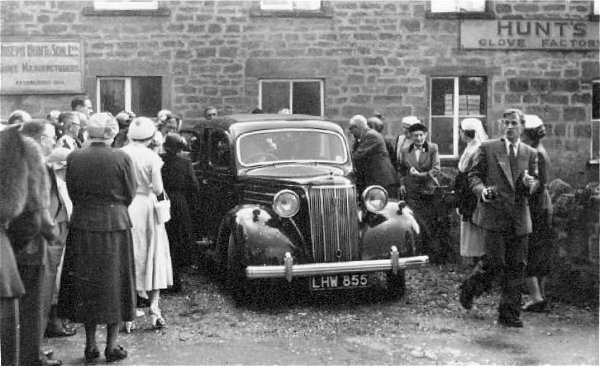 A photograph taken in 1950 and thought to be outside Joseph Hunt & Son Ltd's Huish premises.